Ripping out the water-guzzling grass was an easy decision for Ventura homeowners Sherri and Thurop Van Orman, who wanted a back yard both eco-friendly and still inviting to their young children. “We wanted a place of exploration and natural wonder,” Sherri said. Instead of the patchy lawn there now sits a meandering arroyo and a sustainable landscape of flowering, drought-tolerant native or Mediterranean plants, all fed by a drip irrigation system. Pipes with tiny holes capture runoff from the house’s roof and hardscape, funneling it to areas where it can be absorbed into the ground. 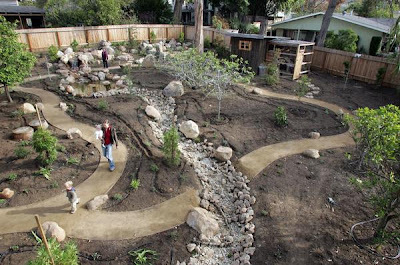 As localities grapple with tough new rules governing runoff, these kinds of low-water, self-containing gardens and landscapes are being encouraged for homes and commercial properties to minimize the volume of runoff reaching the ocean and protected waterways. “Every resident can take simple precautions to ensure water remains clean,” said Arne Anselm, water quality monitoring manager for the Ventura County Watershed Protection District. A self-contained landscape or rain garden is an anti-Army Corps of Engineers, old-style approach. When creeks got channelized and concrete dikes raised along riverbeds, the idea was to move water away as fast as possible. The problem locally is that it finds its way into the Ventura and Santa Clara rivers, Malibu and Calleguas creeks and bays and estuaries, and eventually empties into the ocean. Sustainable landscapes make moving water slow down, absorb, nurture.